Was on the corner of Darby & Laman Streets, late 19th / early 20th century. I think it was the SW corner. ‘Ask for KING TEA, It’s Good.’ Hilliler’s shop, corner of Darby & Laman Street. The late Rev. William Bain, whose memory will be perpetuated by a memorial window in St Philip’s Presbyterian Church, Newcastle, arrived in the city 60 years ago, to take charge of a congregation connected with the Presbyterian Church of Eastern Australia. There was no church of that denomination then. The place of worship was in the old Oddfellows’ Hall at the corner of Darby and Laman streets. It was used for services until a site was secured In Hunter street, near the school of arts, and in 1863 a church was erected there. St. Andrew’s Church, then In Watt street was associated with the Established Church of Scotland. Mr. Bain was minister of the Hunter-street church for 34 years, when he resigned, owing to ill-health. During his residence In Newcastle, he took an active interest in many public movements. He was a good speaker, and when he considered the cause he was advocating a just one, he was fearless in his utterances. Mr. Bain’s wife and daughter, whose memories will be also honored in St. Philip’s Church on Sunday, were great workers for the church for many years. Mr. Bain was clerk of the Presbytery of the Hunter for 42 years, and also moderator of the General Assembly of the Presbyterian Church of New South Wales. Fifteen years ago the church in Hunter-street, and part of the site of the land on which it stood, was sold for £6000. With this money, the site in Watt street was purchased, and a new church built thereon. The name was then changed to that of St. Philip’s. Prior to this, St. Andrew’s Church, which had been in the same street, was sold, and the present place of worship in Laman-street was erected in its place. After Mr. Bain resigned his charge, he continued to assist his successors until the infirmities of age necessitated a rest. 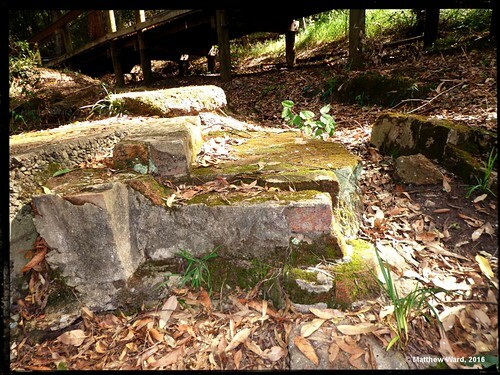 Remains of a building at Blackbutt Reserve? BLACKBUTT RESERVE, 27/3/2016. Remains of a building / other structure? Near where the wooden hut used to be in the 1970s. The footbridge in the background I believe leads to the newer koala exhibit.